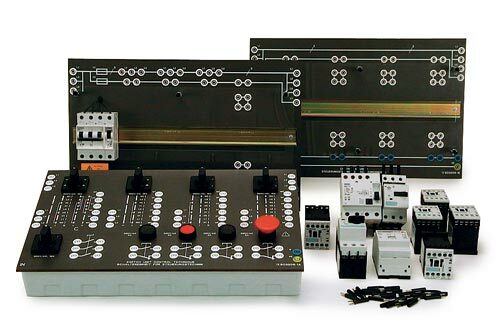 The LN teaching system "Contactor Circuits" has been designed so that electric circuits typical to industrial plants, can be presented in a practice-oriented and didactic manner. Depending on the exercise required, the contactors are suitably arranged on an exercise board and the wiring completed. all electrical connections are achieved fast and without any tools, using 4mm safety-protected adapters. The LN board system provides a particularly practice-oriented type of training, as all connections must be completed by the students. The circuits can be realised with all power classes of machine in the LN-program (0.1kW, 0.3kW and 1kW). The LN-teaching system presented here, is combined with machines in the 0.3kW class that match to the rating of the protection relay. since the training objective is mainly concerned with the construction of control circuits, a test meter or indicating lamp can be used to show the functionality of the circuit. The exercise handbook contains various exercises, each of which includes worksheets for the students in addition to typical results sheets for the Instructor.